Joe Randall was in good form for Northants. A late burst of scoring by Jeff Newson’s rink of Brian Martin and Joe Randall enabled Northants to collect 14 points from their crucial Derbyshire Trophy inter-county championship match against North Cambs at Wisbech to keep alive their hopes of reaching the national final. Several Northants players struggled on a carpet much slower than their home greens at Peterborough and Stamford, but battled hard to acclimatise over the 25-end contest. However, the trio of Stephen Harris, Andrew Thurston and Simon Law quickly latched onto the pace and they ran away 36-12 winners to set up the overall 100-86 victory. The rinks of Martyn Dolby and James Harford often struggled against local knowledge on the end rinks and went down 15-23 and 16-27 respectively. So it was left to the experienced Newson to tidy up the points. His rink transformed a 20-24 deficit after 20 ends by scoring 13 shots without reply in the final stages to earn Northants victory against a team that had taken all 18 points from Hunts, who were earlier victors over Northants. Northants’ final game in the southern section is against Norfolk at Stamford on February 15, and with Norfolk winning 17-1 at home to Hunts, it means that a home success could earn Northants a place in the national final at Newark in April. John Holroyd, Bob Warters, James Harford lost 16-27. Brian Martin, Joe Randall, Jeff Newson won 33-24. Stephen Harris, Andrew Thurston, Simon Law won 36-12; Nick Wilkie, Roger Martin, Martyn Dolby lost 15-23. 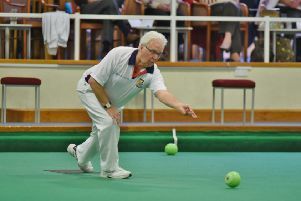 Nicky Brett’s hopes of winning his first world indoor singles title were dashed in the quarter-finals at Potters Leisure in Norfolk. He was beaten 2-1 in a tie-break by Scotland’s Alex Marshall who went on to lift the title for a record sixth time. Next up on the World Bowls Tour for Brett is the International Open which starts in Blackpool on March 1.